U.S. House Prices Accelerating, Fed Succeeding in Inflating New Ponzi Housing Market Bubble? 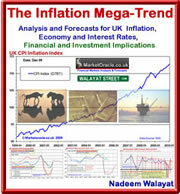 The Fed's QE-Infinity money printing programme to buy mortgage backed securities and government bonds that is running at a monthly rate of $85 billion is succeeding in inflating another US housing market bubble as house prices surge by an annualised rate of 11% in March (28th May) with some cities such as Phoenix seeing house prices soar by an annualised rate of 20%. Now whilst the title of this article may contain the word bubble, however understand this that we are in the very early stages of the housing bull market that follows on from the embryonic bull market of 2012 which has many years to run, so do not make the mistake that many market commentators are making in the wake of the latest data, those who never saw this bull market coming are busy already proclaiming it as bubble that is about to burst. So yes, whilst it is obvious that the rampant money printing policies of the UK and US ARE creating NEW ponzi housing market bubbles, however these bull markets have only just begun and are nowhere near to getting to the euphoria bubble stage as my most recent analysis for the UK suggests that the UK housing bull market could run for the rest of this decade before next popping, hence why I do not see any reason to rush to publish a detailed trend trajectory for the UK market, but rather continue to publish a series of in-depth analysis on its mega-trend drivers ( 03 Jun 2013 - UK Housing Bull Market Opportunities In Britain's Multiculturalism Immigration Crisis), towards arriving at the most probable trend trajectory. 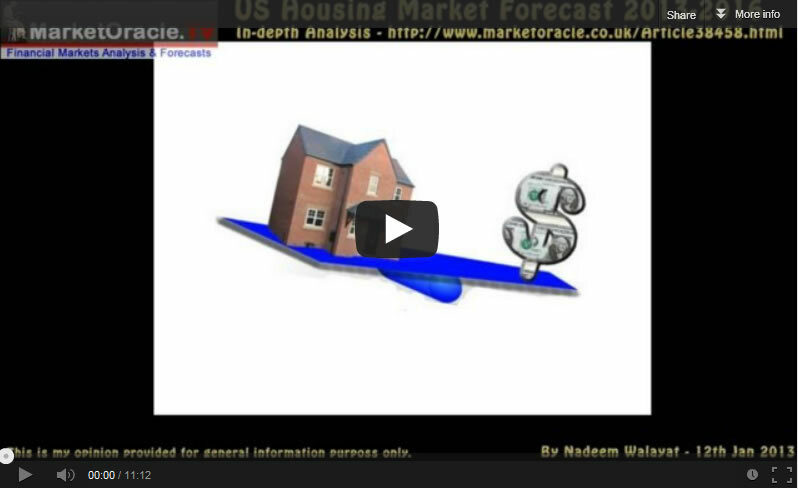 Similarly, whilst my existing US housing market forecast is for into early 2016, that does not necessarily mean that I expect the market to peak and crash in 2016, for it is highly probable that just like the UK this current US housing bull market could last for the whole of this decade, or quite close to, so I see all of the discussions in the mainstream press and blogosfear concerning whether the US housing market is in a bubble or not as being ludicrous because I doubt it will even be in a bubble 3 years from now, let alone today! Your central banks asset price bubbles riding analyst. Schiff is smart money too!! Agreed.It can go up for 3 years too. But before the 10yr gets to 4% you need to cut it loose. Long dollar though anyway. Any REIT's you can recommend? Was looking online, there's 10% net yields on offer with tenants etc in the US. Nadeem you are by far the most accurate dot connector out there, and I have much respect for your analysis. Regarding housing I'm intrigued to the extent you've personally allocated capital toward housing in the UK. I am in the US and based on your predictions we should see several more years of appreciation. I am curious as to your thoughts on the "hot" markets that have already come back 30-40% (AZ, CA). What are your opinions on those areas? Most importantly what do you predict with respect to the escape from bonds, surging interest rates, and a US dollar that is getting "worked around" (use of Yuan, etc), as to its affects on residential real estate? We seem to be at a pivotal point at this time. I am 60% invested in uK housing because that is where I reside, if I resided in the US then I would probably be 60% invested in the US housing market. It is far too much extra risk to invest in foriegn property markets, there are too many factors beyond ones experience. In my opinion rising interest rates are a red herring, just as before them were falling corporate earnings and debt deflation theory for the stock market. But it will only become apparent with the benefit of hindsight exactly why. Though my ongoing series of articles accumulatively do illustrate why which nearly always resolve back to the fundemental driver which is the exponential inflation mega-trend, which is why deflation has always only ever been a delusion.